Need to Improve YOUR Chances of Getting Into Medical School? Graduation isn't too far off in the distance. Your parents are excited and ask many questions about when is commencement? Who's the speaker? And the dreaded, "What do you have to do to apply to medical school?" This is a conversation you're not ready to have. You've already spoken to your prehealth advisor and it's clear you're not competitive for medical school. This isn't a shock to you at all. You knew you didn't stand a chance of getting into medical school. First year you were adjusting to university and didn't know what you were doing and got low marks. You're in a real hole because of this and don't know how to get out of it. Immaturity screwed you academically but now 4th year is here. You realize medicine is something you really want. Now you're looking for a second chance to show your real capabilities. There are no real reasons for poor grades. However, the fact remains it is holding you back from both DO and MD schools. Getting into medical school isn't just about you. And now you got a big problem. You came to college not only for yourself, but will high school classmates and most importantly you had the support of your family. Family members were the ones who picked you up from sports, took you to your piano lessons, and shuttled you back and forth to your various volunteering activities. Worked with you late into the night on science projects, got you tutoring for SAT/ACT all so you could get into the best college possible. Desperation sets in as you realize the sacrifices made for you. This is your opportunity to make your relatives proud and you're letting them down. You were supposed to excel in college or at least do well enough to be competitive for medical school. The words of your organic chemistry TA comes to mind, "with grades like these you'll never get into medical school." He couldn't have been correct, could he? All you can think of is his speech before each exam, "No medical school. No surgery. No millions. All down the drain." You want to get into medical school and beome a doctor. No prehealth advisor is going to crush the goals you've had since a child. You are going to do whatever it takes to become a doctor. If this means more time and taking out student loans to invest in your education you will do it. Because you have a ton of research experience. You've volunteered and have over 300 hours. All you can see is becoming a doctor. Imagine the excitement when instead of a thin envelope containing yet another rejection letter is replaced by a thick manila folder holding your acceptance to medical school. You just got a new chance at life and can't contain yourself because no matter what you're going to be a doctor. Relatives stream into the auditorium and loud applause as your name is called to receive your White Coat and be introduced to the elusive club of medicine. You are overjoyed at this moment because you know the struggles and the journey you went on. It wasn't easy but now you're here. You're a Student Doctor. You need the Post Bac Guidebook for Getting Into Medical School because you have a big problem. Your undergrad GPA is not competitive for medical school. If you ever want to become a doctor you need this book. In it you'll discover 35 post bac programs designed specifically for premeds who want to get into medical school. The ebook will show you how to take one or two years of coursework geared specifically for medical school. This is your 2nd chance to show you have what it takes to get into medical school. You're not the only one nor will you be the last. Yes, even with a very low GPA you can still get into a post bac program. It won't be easy but it's possible. 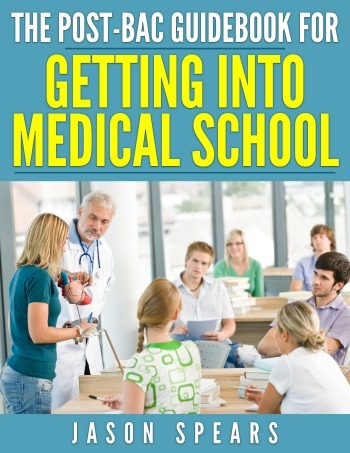 Stick with me and I will show you how in my Post Bac Guidebook for Getting Into Medical School. How to choose the best post bac for your specific needs so you have your best chance of getting admitted when you’re ready to apply to med school. I walk you through the four main post bac options you will have to consider and explain what sets each apart. Are you in a rush to get to medical school? Then you’ll certainly want to know about linkage programs which eliminate a lag year in applying...allowing you to go directly from your post bac to medical school without going through the year long application process. The difference between Formal vs Informal post bac structures and how this will affect your curriculum and the length of time you will be enrolled. Plus, knowing what separates a Formal from Informal program will determine if you have to guess which classes med schools want you to take versus taking a predetermined set of courses that match exactly what medical schools are seeking. Why you should pursue a Special Masters Program (SMP) if you have already completed some or most of your premed requirements. There’s a huge benefit for your GPA when applying to med school with a graduate level degree which dramatically enhances your chances of becoming a doctor. A complete review of over 35 distinct programs all in one place. You can easily compare programs and discover which will best meet your needs for getting into medical school. Discover eligibility requirements, curriculum, admission components and selection criteria, along with deadlines. This way nothing is left to chance and you boost your chances of successfully getting into the post bac program of your choosing. If you're like most students... researching programs is not high on your priority of to do lists. I've gone ahead and done the research for you. All you have to do is scroll to the section of the book that you most identify with and then get a concise overview of each program. In a nutshell the Post-Bac Guidebook for Getting Into Medical School is a college guide for medical school admissions. Who Chooses a Master Program? Get rid of uncertainty about your chances of getting into medical school. Imagine putting the finishing touches on your Personal Statement, choosing the 15 medical schools you want to apply to and hitting submit on your Primary Application. In a few short weeks the secondaries come rolling in followed by invites to interview for medical school. Everything is falling into place better than you ever thought possible. Your parents are so proud of you because you'll be starting medical school. You’re going to bring so much pride to your family as you earn your title of DOCTOR. This is your dream come true because you never gave up on your passion for medicine and invested in the Post-Bac Guidebook for Getting Into Medical School. Immediately after your purchase, you can download your eBook and instantly be on your way to finding the best post bac program to get you into medical school.